But a quick table of the results of the variable, account_category, shows 8 in the dataset. The additional three are Commercial, Non-English, and Unknown. At the very least, we should drop the Non-English tweets, since those use Russian characters and any analysis I do will assume data are in English. I'm also going to keep only a few key variables. Then I'm going to clean up this dataset to remove links, because I don't need those for my analysis - I certainly wouldn't want to follow them to their destination. If I want to free up some memory, I can then remove the large dataset. Now we have a dataset of 2,135,646 observations of 4 variables. 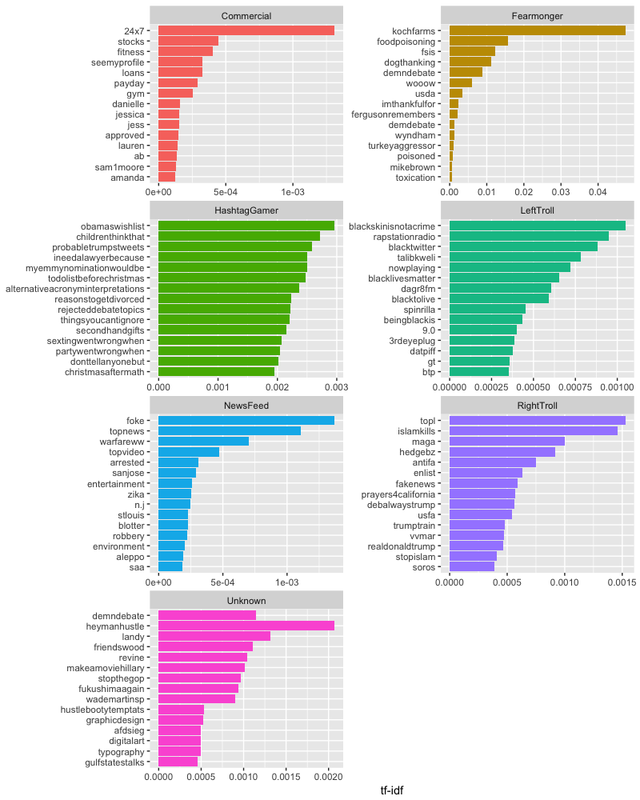 I'm planning on doing some analysis on my own of this dataset - and will of course share what I find - but for now, I thought I'd repeat a technique I've covered on this blog and demonstrate a new one. First, I'll conduct a TF-IDF analysis of the dataset. This code is a repeat from a previous post. But another method of examining terms and topics in a set of documents is Latent Dirichlet Allocation (LDA), which can be conducted using the R package, topicmodels. The only issue is that LDA requires a document term matrix. But we can easily convert our wordcounts dataset into a DTM with the cast_dtm function from tidytext. Then we run our LDA with topicmodels. Note that LDA is a random technique, so we set a random number seed, and we specify how many topics we want the LDA to extract (k). Since there are 6 account types (plus 1 unknown), I'm going to try having it extract 6 topics. We can see how well they line up with the account types. Now we can pull out the top terms from this analysis, and plot them to see how they lined up. 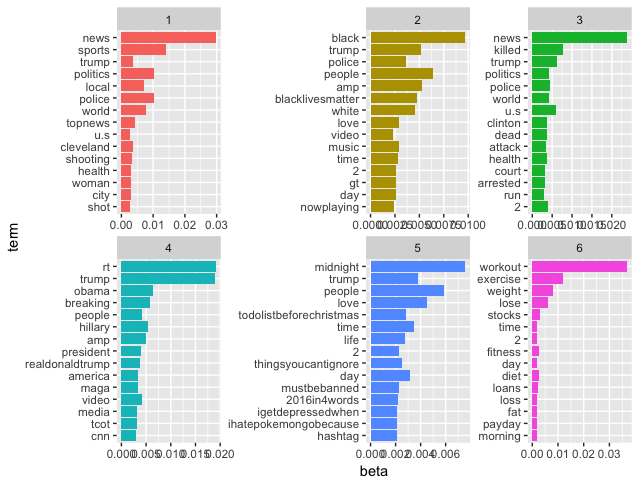 Based on these plots, I'd say the topics line up very well with the account categories, showing, in order: news feed, left troll, fear monger, right troll, hash gamer, and commercial. 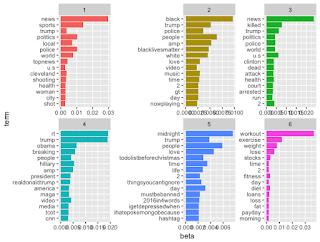 One interesting observation, though, is that Trump is a top term in 5 of the 6 topics. Using underscore is very not R style. You can see all base and recommended packages do not use that in names. There is a reason: R power users use ESS and the underscore is tied to the <- so it becomes almost impossible to use such names within ESS. the creators of the library must be using R occasionally and not as primary tool. What is "R style"? Where do you find the list of "recommended packages"? Are all R users who do not use ESS unworthy of the title "R power users"? Have you checked the most downloaded packages in R over the past few years? Looks like you have your own comment trolls to conduct analysis on! Might be worth disabling comments in general. Hi I was wondering if you have undertaken a network analysis of who retweets whom in the network. Analysing the network of trolls do you see any central nodes or behaviours?